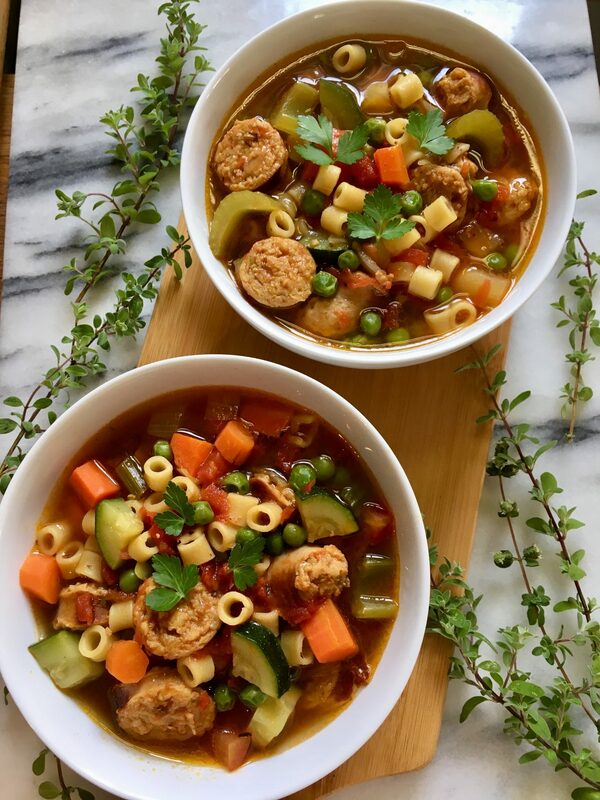 These long, cold and rainy days we’re having in CA makes me crave for warm Ditalini soup with chicken sausage and vegetables. And yes, I like it piping hot. Good thing it’s so easy to make especially on a Sunday afternoon. 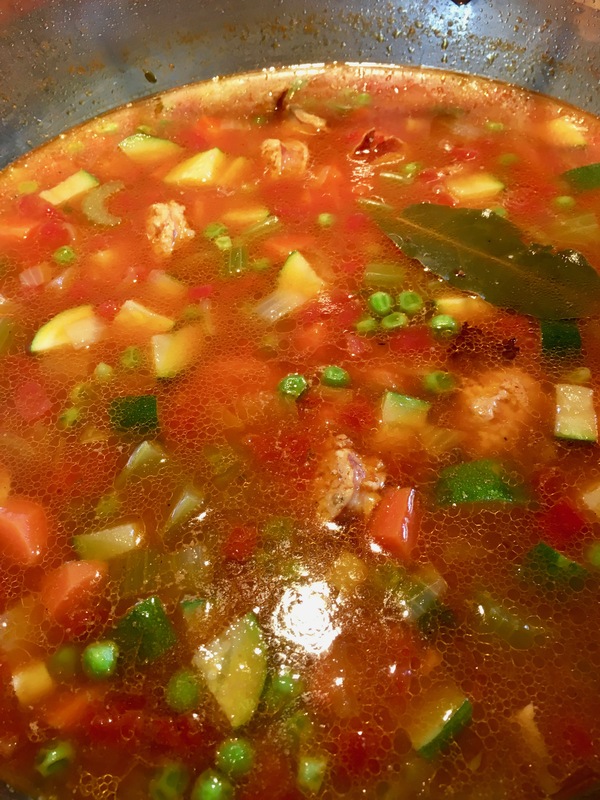 So I usually make a big pot of this soup to have leftovers for lunch the next day. Ditalini is an Italian pasta that looks like a small tube. Because of its small size, it’s absolutely perfect to use in soups. For the vegetables, I really just use whatever I have in the fridge like carrots, celery, onion, frozen green peas, and zucchini. If you have spinach, of course you can add that too. 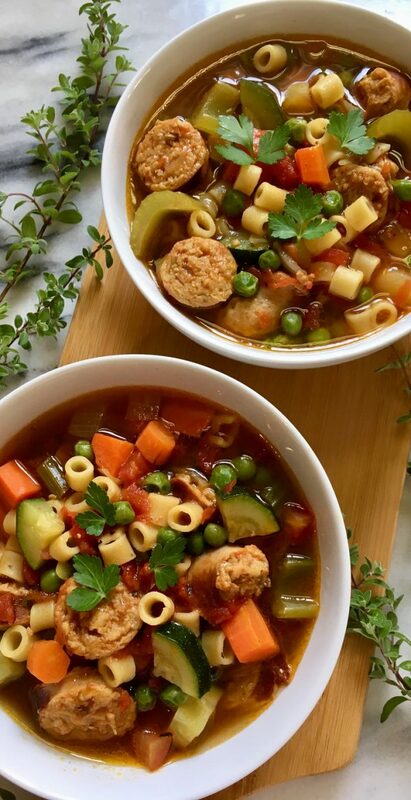 Although this soup is simple and clean, it is scrumptious. At serving time, a sprinkle of freshly grated parmiggiano cheese or parmesan on top adds a rich flavor to the soup. Heat olive oil in a dutch oven or pot on medium/high heat. Next, brown sausage in oil for 8-10 minutes turning once halfway. When cooked, transfer into a plate and set aside. Lower heat to medium and sauté onion for 3 minutes. 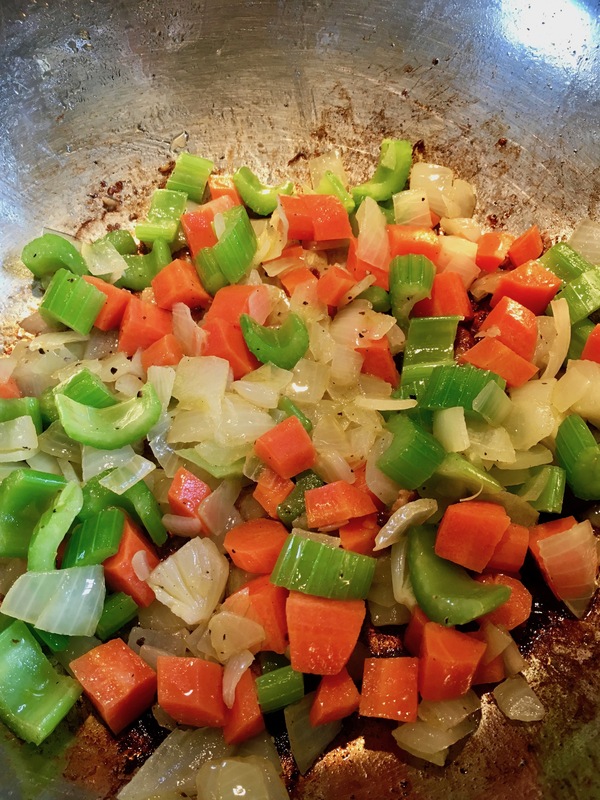 Then stir in garlic, celery and carrots. Let cook for another 3 minutes. Add tomato sauce and let simmer for 1 minute. Then add chicken broth, 1/2 tsp salt, 1/4 tsp freshly ground pepper, thyme and bay leaf. Cover the pot and let it come to a boil on high heat. When it starts to boil, lower heat to medium/low and let simmer for 15 minutes. Stir in pasta and let it cook on medium heat for 8 minutes. 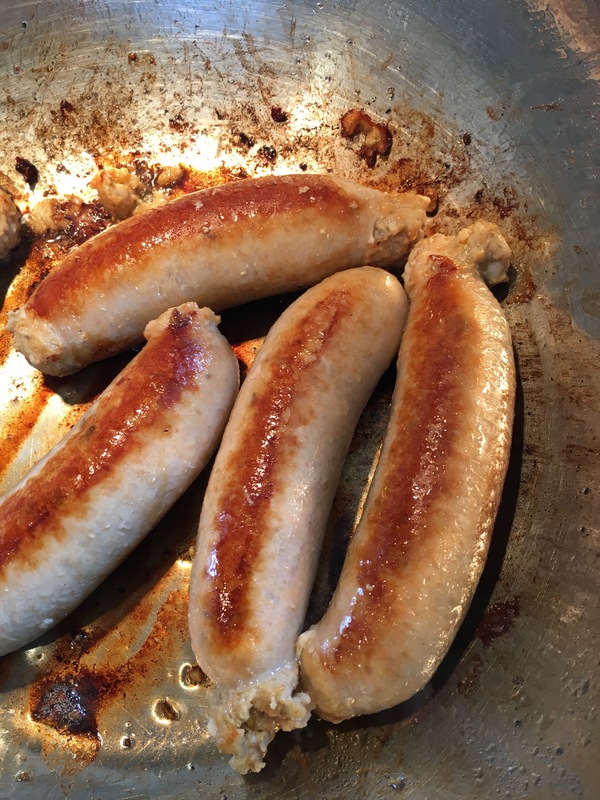 Meanwhile, chop cooked sausage to 1/4 inch thick. Then add sausage, green peas and zucchini into the pot. Cover and let simmer for 5 minutes. Adjust seasoning with salt and pepper to taste. Serve warm with a sprinkle of parmiggiano cheese on top.